6.15 Scrummy - added more pesto. A friend made this for my family when my husband was quite ill and he could only eat liquid food. She told me where I could find the recipe as he liked it so much. A very quick and easy soup to make. Hardest bit and most time consuming is the chopping of the pumpkin. Our local supermarket will cut them up for you - in which case this soup is a doddle. Failure to get hold of lemongrass I used a kaffir lime leaf scrunched up to release more flavour. I know recipe says that lemon rind can be used as an alternative but I thought Id try it with the kll. A great soup to have on a Winters day - or even make to put in freezer for those days when you really cant be bothered and want something warming. 5.12 I prefer without orange. 2.12 Yum for a change. 6.12 Yum, quick and easy def try again and mix it up. 6.12 Yummy - but needed to thin down a bit. One of my standard vegetarian recipes. I use whatever cooked greens I have around. Last night it had a combination of misome, mizuma, chinese cabbage, pak choy and kale! 6.12 Didn't have pears and I burnt walnuts but turned out delish - used rocket pesto. Great flavours - serv - super autumn side. 1.12 Great flavours - best made on the day. Excellent recipe! I sometimes add chocolate chips for the kids and bake it in muffin tins...........they love it! 5.16 This recipe is not in my version of cookbook. The ever-popular The Best of Annabel Langbein: Great Food for Busy Lives is the essential kitchen handbook for modern living. 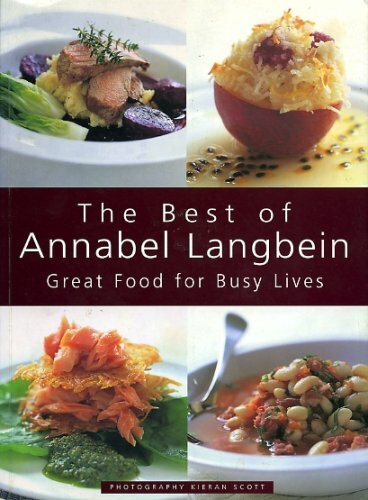 Annabel is renowned for her delicious recipes that are quick and easy to make. The 600-plus recipes in this book are accessible and innovative and will inspire cooks of all abilities to create everything from breakfasts and brunches, appetisers, soups and salads to desserts, baking and preserves. Things can sometimes go wrong in the kitchen but Annabel's down-to-earth, no-fuss approach draws on a lifetime of cooking skills to demystify the processes and inspire confidence in her readers.